Budapest is not on the Euro, so you will need to change the Hungarian currency called Forint: but where to get the best exchange rates? First of all, do not buy Hungarian Forint (HUF) from a street vendor. No matter what. Secondly, once you get off the airplane or train, you can find exchange bureaus easily but they tend to give approx. 25% less for your money than the ones in the city centre, or off the airport / station! So if you have to change, only get enough Forint for your Budapest airport transfer / bus ride. Currency Exchange, i.e. 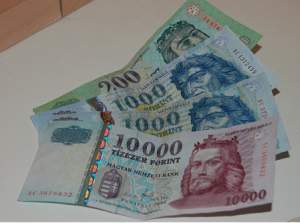 buying Hungarian Forints should not be a problem at all in the capital city of Hungary. 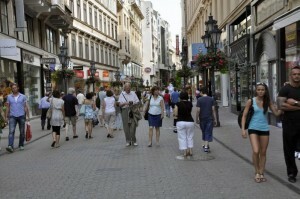 Downtown Budapest is full of legal and quite fair-priced exchange offices. You can also use the ATM at Budapest Airport and at other tourist hot spots. This website enlists dozens of currency exchange companies in Budapest, Hungary, and you can arrange the list according to the best rates, which are really really good. Of course, the website is not definitive, the prices are to inform not to promise. But we have had quite good experience with the data we found here. Please let us know what your feedback is by sending your comments below. The interface of the website is in Hungarian, but with google translate, you can easily fill in the advanced search form for the best Hungarian Forint rates. To help you through the search for the best rates in Budapest, we have filled in the form to show you an example (selling 100 Euros for Hungarian Forints – we have chosen the option “eladni szeretnek” which means I wish to sell). Kerulet is DISTRICT: in the example we have chosen the city centre, District V (V. ker) with city central places of interests and attractions in downtown Budapest, such as Deak Square, Erzsebet Square, Vaci Street (the shopping street), Vorosmarty Square, Chain Bridge, Parliament, Basilica, etc. District VI is also part of the city centre. Please pick a district of your preference. Halozat / Cegcsoport: this option enlists all the currency exchange vendors, companies in Budapest, so it is best to be left as it is, if you are interested in the choices of all booths and vendors. 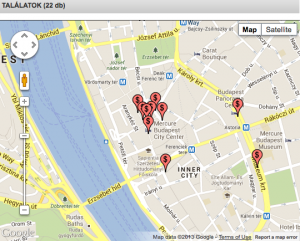 What you will get in the next interface (the following page) is the following: the map of Budapest currency exchange booths in the district of your choice in the form, in a very well presented interactive google map. Each red balloon shows a booth, or company, or a travel agency doing currency exchange, buying and selling Euros, GBP pounds, US / AUS / CAN dollars. If you click on the balloon, you will get the detailed info of a given exchange place, e.g. As you can see, there is really no need to rush to the pricier airport exchange rate offices, and please do forget street vendors. On the other hand, rarely though, but there are still a couple of street vendors selling Hungarian banknotes, and promising a better exchange rate than official vendors. This is not only illegal but also dangerous, or at the least absolutely not cost-efficient. If you fall for some unreliable guys, you may end up with fake banknotes, or banknotes that are not in use any more at all. We recommend using the official currency exchange booths in the city for changing money as oftentimes they give better rates than banks in Budapest. If your own bank offers a good deal to you while travelling abroad, you may consider the ATM machines too, which are easy to find (5-10 min walking in the city centre and by attractions). Again, official currency exchange vendors are really abundant in the city, and many have good weekend opening hours. For a not too favourable rate, you can also go the banks in Budapest, but only as a last resort. Bank rates are in general lower than currency exchange rates in booths. Exchange rates fluctuate of course, so you may need to test what is better for you: maybe you can save some money by withdrawing cash from the ATM rather than buying Hungarian Forint at an exchange rate office. Several stores, supermarkets, boutiques, international retail chains accept bank cards in Budapest (Visa or MasterCard is a sure bet). Our experience is that banks in Hungary are more expensive than exchange rate offices.